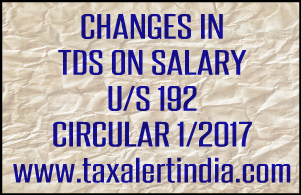 CBDT issued corrigendum of circular no. 1/2017 dated 2 January 2017. There are few changes in the rule which may read as follows. The acquisition or construction of the house should be completed within3 years from the end of the FY in which the capital was borrowed. Hence, it is necessary for the DDO to have the completion certificate of the house property against which deduction is claimed either from the builder or through self-declaration from the employee. The acquisition or construction of the house should be completed within 5 years from the end of the FY in which the capital was borrowed. Hence, it is necessary for the DDO to have the completion certificate of the house property against which deduction is claimed either from the builder or through self-declaration from the employee. 31 May of the financial year immediately following the financial year in which the deduction is made. value of which is to be determined under section 23(2)(a) or section 23(4)(a), as the case may be.